Ting (standing first row, seventh right), Yii (standing second row, fourth left) with some volunteers during the beach clean-up. MIRI: More than 1,000 volunteers observed Miri’s International Coastal and World Cleanup Day 2018 campaign by participating in a beach cleanup at Marina Bay Beach yesterday. It was organised by Malaysian Nature Society (MNS) Miri branch in collaboration with Miri City Council’s (MCC) Local Agenda 21 (LA 21), Pustaka Miri, Coco Cabana Miri, Northern Sarawak Journalists Association (NSJA) and Junior Chamber International (JCI) for Riam, Lutong and Miri. 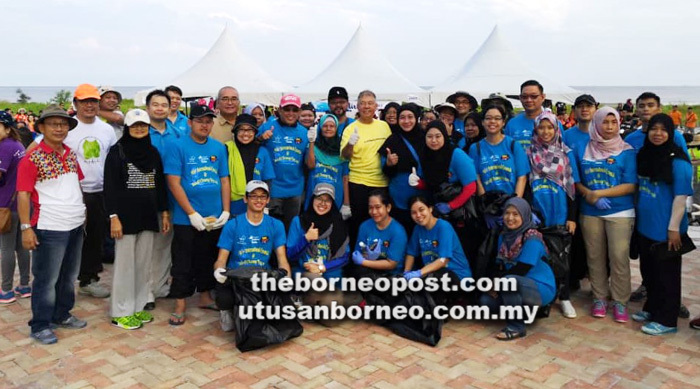 Organising chairman Iqbal Abdollah said the cleanup marked the start of the inaugural campaign held in conjunction with International Coastal & World Cleanup Day, International Year of the Reefs (IYOR) and 55th Malaysia Day celebration. Volunteers pick trash along Marina Bay Beach. “Besides government agencies, those from non-government agencies (NGO), schools and individuals joined the work party for the beach cleanup, collecting 8,817.4kg of trash washed up on Marina beach,” said Iqbal, who is also the chairman of MNS Miri branch. SM Sains Miri won first place for collecting the most rubbish with 1,288.2kg followed with Go Kleen in second and SMK Lutong, in third place. Piasau assemblyman Datuk Sebastian Ting, Miri mayor Adam Yii, MCC secretary Morshidi Fredrick and MCC councillors were also present to support the campaign. Meanwhile, the Upcycle Ocean Trash Competition is being held today (Sunday) at Coco Cabana Miri, offering cash prizes and trophies to winners of three categories namely primary schools, secondary schools and institutions of higher learning. Themed ‘Wonders of Sarawak’, the competition requires students to build replicas of Sarawak’s landmarks with trash collected from beaches. The champion in each category will win RM500, while second and third place winners will receive RM300 and RM200 respectively, along with trophies and certificates of participation. Five consolation prizes of RM100 each will also be given. Participants also stand a chance to win two special prizes of RM250 and certificates for Environmental Sustainability from MNS Miri and RM200 cash for Public Jury Award.